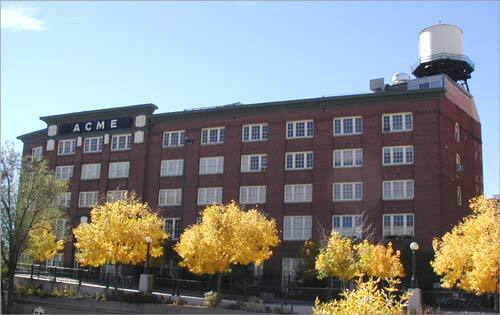 Acme Lofts is located where Wazee Street crosses the Cherry Creek in historic Lower Downtown Denver (LoDo) - easy walking distance from an array of restaurants, pubs, museums, and cultural performances. Expansive views of the city, mountains and Cherry Creek are available from many of the loft residences and the common rooftop deck. The building originated in 1909 as the home of Brecht Chocolate and Candies, which produced more than 3 million pounds of sweets annually. The next owner that occupied the building until 1968 was the Acme Upholstery Company, a manufacturer of fabric, mattress ticking and foam cushioning. In the early 1990's the building was acquired and in 1992 converted to residential lofts. Features of the historic loft building include heavy timber beams throughout, original brick walls, hardwood, and fireplaces in some of the loft residences.